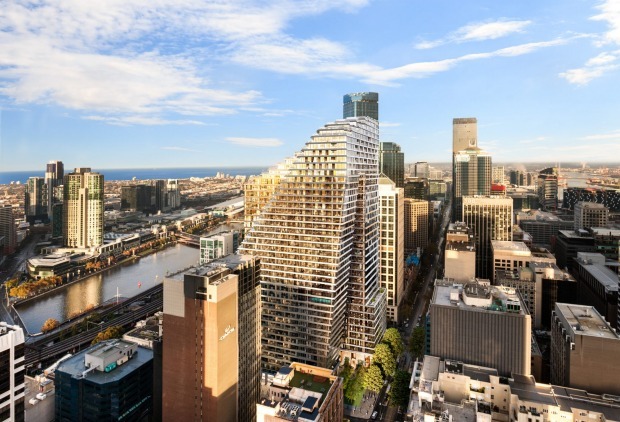 Japan’s Daisho will buy the hotel component of Cbus Property’s Collins Street development in Melbourne in a $220 million deal. The $1.25 billion mixed-use project comprises two towers linked by a skybridge in a dramatic design which has earned it a popular moniker as the “Pantscraper”. Collins Arch, as it is more formally known, includes a hotel component of 294 rooms across 15 levels as well 205 apartments and 49,000sq m of office space. The hotel will be operated as a W Hotel. Japanese billionaire Katsumi Tada’s Daisho – which owns a string of hotels including the Park Hyatt in Sydney – will acquire the hotel in a deal understood to be worth at least $220 million. Global hotelier Marriott International will operate the venue through its top range W brand, the first to be opened in Melbourne. “Collins Arch was designed as a world-class destination and we’re extremely excited to announce W Hotels as operator of our luxury hotel,” said Cbus Property chief executive Adrian Pozzo. Melbourne firm Hachem has been appointed to design the hotel’s interiors. “It’s an amazing location, smack bang in the middle of the trendy shopping and entertainment district. It will appeal to jet setters and trend setters,” Sean Hunt, Marriott’s vice-president for Australia, New Zealand and the Pacific, told The Australian Financial Review. The W is one of Marriott International’s luxury brands, placing it above five-star brands such as the Westin and alongside Ritz Carlton, St Regis and Bulgari. The new hotel is one of five luxury hotels in the region being developed by Marriott, including a W Brisbane and Ritz-Carltons in Melbourne, Perth and Auckland. The hotel deal was brokered by Savills’ Michael Simpson, who said the opportunity had been hotly contested by investors while a number of luxury brands had shown interest.